I have downloaded a portable WPU at the official site today , and uninstalled a program by it. Then I found WPU deleting files at the folder of C:/.../Microsoft Office/Shared files/..
After some seconds, WPU finished deleting, I couldn't find my Office links, what's more, I find my D Disk has lost its half data!!! My D Disk always has 270+GB data, but now it was only 170GB. Many many important data has been lost. How can I recovery my data! It's very very serious. It was unfortunate as it could be. These links are both direct links.. Please Try to retrieve the lost files with Wise Data Recovery. Thanks. A similar problem I had too. I installed the WVD in folder D:\Program Files (x 86) believing it will create a folder ("wise" or "wvd" or similar) and seeing that settled bulk, I run the uninstall.exe to reinstall the program in the correct folder. The result was DESTRUCTION. Deleted all the programs (4 GB) that were in that folder. With Wise Data Recovery I was able to retrieve about 2/3 of files but with effort 2 days and manually copy multiple files. Tragic. Why there is no portable version for this program? I guess the same thing happens with other wise programs that use the same installer. Can you tell me that you run Wise Program Uninstaller to uninstall which program, we need to test it. The thumbnail, I click Force Uninstall button to uninstall wise video downloader, all items are wise video downloader files. 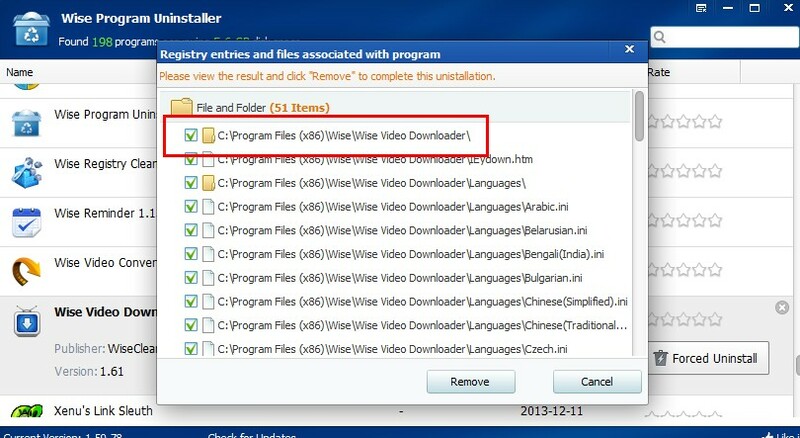 I didn't use the Wise Program Uninstaller but the uninstall.exe file of Wise Video Downloader. You can download its portable version by Click Here.